The annual ServiceNow conference, Knowledge, is coming up soon and expecting to draw 10,000 IT Professionals dedicated to transforming IT service and service relationships across their enterprises. 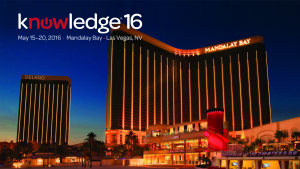 Join Cask at Knowledge16 – May 15th-20th at Mandalay Bay in Las Vegas. Cask will be teaching 2 Pre-Conference Workshops at this years Knowledge Conference as well as exhibiting at the event. Cask will be teaching two Pre-Conference workshops, starting Sunday, May 15th. These are both one and a half day courses. More information on the two courses are listed below. Make sure to sign up here, and look for the courses if you are attending as spots will fill quickly. Have you been asked to defend your costs in an atmosphere where the underlying belief is that your operation costs too much? Are you being asked to do more with a flat budget or forced to defend why allocations need to go up to meet additional expenses? In this session you’ll learn how to build and leverage a service portfolio with an investment based budgeting approach that will help you run your operation like a business and change the dynamics with your constituency from a defensive position to a valued partnership. Are you looking for best practices on how to effectively manage and govern your ServiceNow investment and transformation activities? Do you have a list of ServiceNow requirements that continues to grow from other parts of the Enterprise, but your support staff doesn’t? Are you looking to sunset legacy applications and transition their functions to ServiceNow, and need to know where to start? In this session you’ll learn about the key components to setting up a successful ServiceNow Governance program so that you can proactively forecast demand for products and services as well as enhancements and defect repairs, clarify decision-making accountability and alignment across stakeholders, and ensure technology is fit-for-purpose and fit-for-use.